KNIGHTDALE, North Carolina (WTVD) -- A lot has changed for Rachelle Friedman Chapman since the accident nearly seven years ago that put her in the wheelchair where she now sits. Rachelle now happily plays a game of peek-a-boo with her daughter Caylee outside of her home in Knightdale while explaining how her life as evolved since that night. At her own bachelorette party a month before she was to marry her college sweetheart, Chris, a friend's playful push into a swimming pool left Rachelle paralyzed. The doctors told her she'd never walk again. "The night that I got hurt, I actually asked the EMTs, can I still have children? And they were like, yes," Rachelle said. Hopes of building a family of their own were soon dashed after Rachelle and Chris married the following year; her medication wouldn't allow her to carry a baby by herself. But then a long lost friend and fellow ECU Pirate answered the Chapman's plea for help and became their surrogate. "She's literally the reason that we have a family now," said Rachelle. Now, while husband Chris, a middle school science teacher, goes to work in Wake Forest, Rachelle's mom Carol drives from Virginia Beach, spending the week doing what a mother does, helping her daughter. "She has sacrificed so much to be here for me," Rachelle said. "We get along really well. We're best friends. But it stinks that she has to kind of pick up the pieces from an accident that wasn't her fault." While motherhood is far from easy, it's made all the more challenging for Rachelle whose story thrust her into the spotlight. 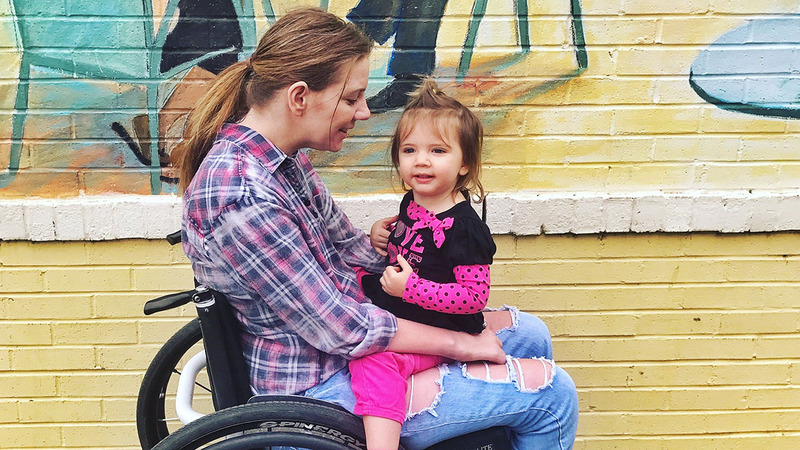 "There's a lot of people who are like, she's a quadriplegic how can she even be a mom? Some people even called me selfish for wanting a child," she said. This mom is now using her voice, hoping to silence that type of criticism in a one-hour special airing Monday on TLC. Viewers will experience a year in the life of her young family, celebrating the ups and struggling through the hardships. "I've gotten really, really strong over the past year," she said. "I've been going to the gym. I've been faster in a sport that I play called wheelchair rugby." Still, Rachelle reflects on the accident that changed her life forever. "Thinking about the accident, it's actually gotten- I want to say in some ways a little harder because now, I have more to miss having a daughter," she said. "I want to run around with her and I want to teach her how to swim by myself because I was a lifeguard." Through it all, Rachelle's reaching out to others, working to regain their independence. "I'm hoping my special will not just educate people who aren't knowledgeable about spinal cord injuries, but help people who have a new spinal cord injury," she said. "Caylee really does drive me to be more independent because one day I want to be able to completely take care of her by myself."